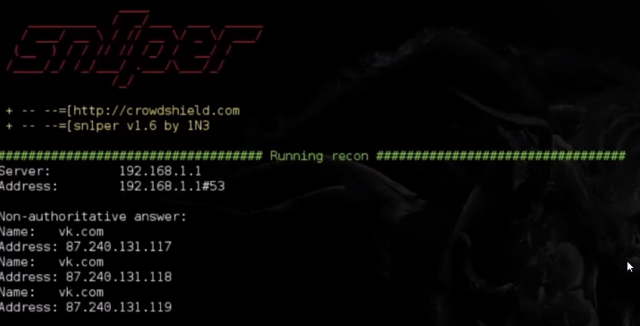 Sn1per is a penetration testing automation scanner that can be used during a penetration test to enumerate and scan for vulnerabilities. REPORT: Outputs all results to text in the loot directory for later reference. To enable reporting, append ‘report’ to any sniper mode or command. DISCOVER: Parses all hosts on a subnet/CIDR (ie. 192.168.0.0/16) and initiates a sniper scan against each host. Useful for internal network scans. PORT: Scans a specific port for vulnerabilities. Reporting is not currently available in this mode. FULLPORTONLY: Performs a full detailed port scan and saves results to XML. WEB: Adds full automatic web application scans to the results (port 80/tcp & 443/tcp only). Ideal for web applications but may increase scan time significantly. NOBRUTE: Launches a full scan against a target host/domain without brute forcing services. AIRSTRIKE: Quickly enumerates open ports/services on multiple hosts and performs basic fingerprinting. To use, specify the full location of the file which contains all hosts, IP’s that need to be scanned and run ./sn1per /full/path/to/targets.txt airstrike to begin scanning. NUKE: Launch full audit of multiple hosts specified in text file of choice. Usage example: ./sniper /pentest/loot/targets.txt nuke. LOOT: Automatically organizes and displays loot folder in your browser and opens Metasploit Pro and Zenmap GUI with all port scan results. To run, type ‘sniper loot’. There’s a sample report availabe here.